The supine position is a term used in anatomy and medicine to describe an organism on its back. This position can be used to describe any organism with clear dorsal and ventral sides. In the supine position, the dorsal side, or back, goes towards the ground. The ventral side then points toward the sky. The supine position is opposed to the prone position, where an animal or person is lying on their stomach. This can be seen in the image below. 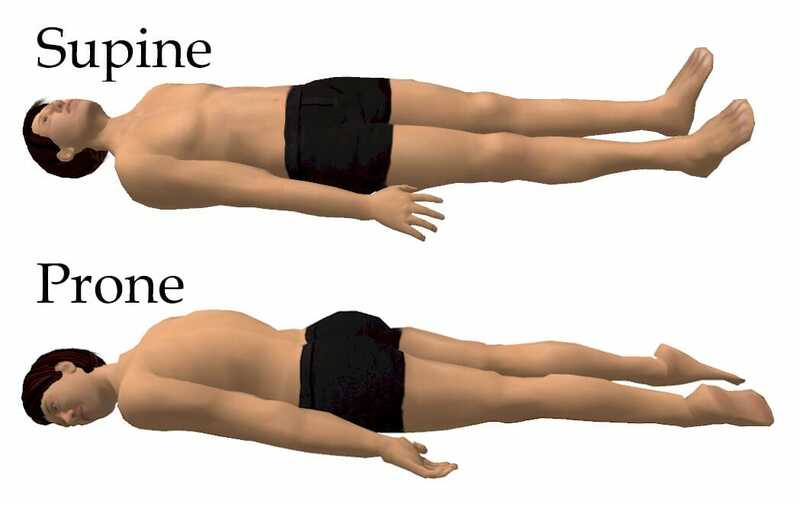 The supine position is used in a number of fields to orient a specimen, subject, or person into the correct orientation. For instance, many surgeries are conducted in the supine position to allow access to the majority of the internal organs. Other surgeries, like certain back surgeries, must be conducted with the patient in the prone position to allow access to the dorsal side of the spine. Other doctors may study how a patient sleeps using the supine position. A polysomnograph is a test done on a sleeping person which records how they sleep in various positions, supine included. The supine position is also used in veterinary medicine to position animals on their backs for various procedures. Other, non-medical professionals also use the position. In comparative anatomy scientists may place two different specimens in the supine position to compare their ventral anatomical features. In rehabilitation, sports training, weight-lifting, and yoga, the supine position is an important starting position. From this position you can begin a wide variety of exercises and stretches. It should be noted that while the supine position is in general any position with the subject on its back, many professions and fields may have specific adjustments or nuances that accompany their field. De luliis, G., & Pulera, D. (2007). The Dissection of Vertebrates. Amsterdam: Academic Press. Nakos, G., Batistatou, A., Galiatsou, E., Konstanti, E., Koulouras, V., Kanavarous, P., . . . Bai, M. (2006). Lung and ‘end organ’ injury due to mechanical ventilation in animals: comparison between the prone and supine positions. Critical Care, 10(1), R38.